Chop. Roast. Burn. Boil. Ferment. We transform the animal and vegetable world into innumerable forms. Life does this to us too as if we were food: It hacks, blends, sears, and bakes us, turning us from the raw material of childhood into the innumerable forms of humanity. Life chews us up and makes a meal of us. In the end we are all transformed. 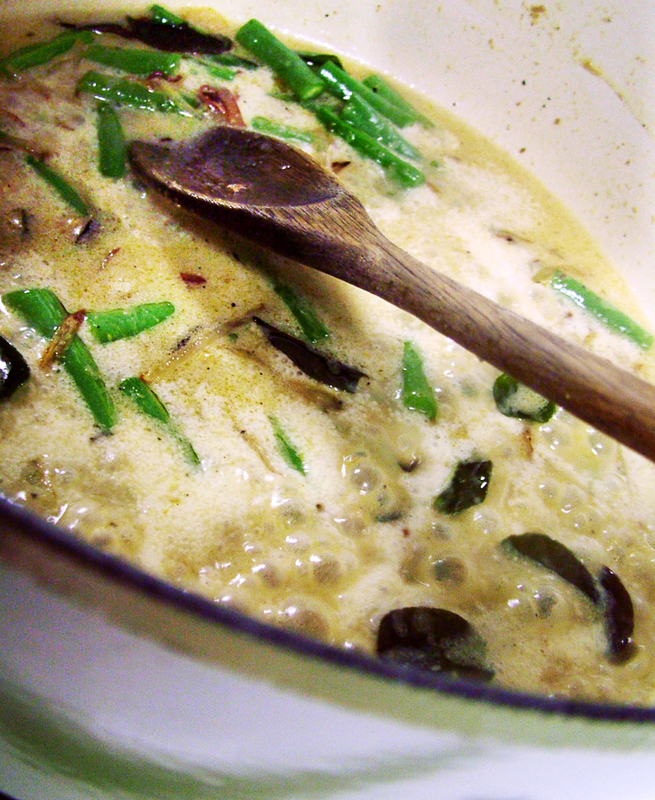 Cooking is controlled transformation, a grammar of modification. Even in my tiny kitchen at home, it’s one place where I can use destruction and pressure towards controlled, positive ends. The education of a chef is an education in timing and controlling transformation. Turn the heat up too high on a custard and it will break. Crowd the onions too much and they won’t caramelize. Let the dough rise too long and the yeast will die. I could go on, but the point here is that cooking is about changing position and shape and temperature with good timing to create something that tastes good and has meaning, whether that meaning is to nourish, to feed a family, or to soothe heartache. Simmer: a state just below the boiling point. The things I’m most passionate about are centered about this idea of transformation. The word. The ingredient. The color. The code. I’m envious of those with singular passions, but if I had the financial means to be a studio artist all day, every day, I would still seek more than one mode of expressing my desire to transform the world around me. This used to disturb me and I thought it was a character defect and a handicap in my life as an artist. But I’m coming to think of it as a unique benefit. My center is located not in my materials but in the moment of transformation where “meaninglessness” changes to “meaning.” My mutability affords me a great deal of creative flexibility. Why food, though? Why the chef’s knife and the cast iron? First of all, I love to eat, so there’s that. But cooking at home is also a low-stakes creative endeavor. 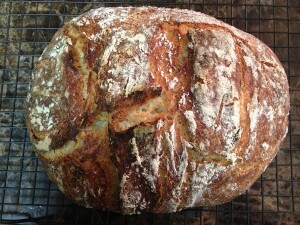 Learning to bake bread is a good example. I keep trying and failing and succeeding and failing again. Flour and salt are cheap. It’s ok if I have to throw it out. It’s ok for me to fail and fail again. I’m learning all the million little ways that flour, salt, and water can become something new through nothing more than yeast and heat of the oven. When it works, I’m able to feed family and friends at my table. That’s meaningful. But unlike the rest of my life, there isn’t much to lose in the failure of bread. runs rivulets into crevices, smoked esters in every crevasse. until foolish longing for sweet remains. There is a good deal of joy to be had in the ridiculous failure in a gummy loaf of sourdough compared to those things. Our capacity and willingness to change in the face of pressure and destruction is as important as an ingredient’s capacity to be transformed in the presence of heat. Brillat-Savarin put it like this: “Liquids which you expose to the action of fire cannot all absorb an equal quantity of heat; nature has made them receptive to it in varying degrees. It is a system whose secret rests with her.” The beauty of the human condition (as opposed to the natural elements) is that we have a choice in how we respond when life turns up the heat, carrots don’t. I try to pay attention to my own raw material as it responds to what life puts in front of me. I know that lately I’ve been getting pressure from all sides of my life and the temperature keeps going up and there never seems to be enough time and space to decompress. I don’t want to explode. Things have exploded before. It’s messy and painful and more difficult to clean up than stewed tomatoes or home-brew in a carboy. And so I write and I cook and I remember. I remember that not all transformations end in disaster. If you’re writing about food, try thinking of ways that the theme of transformation plays a role in both cooking, eating, and personally. The transformation of solids, gasses, and liquids is crucial to cooking. Food is transformed once it is consumed. What happens in that transformation? How has the introduction of new foods transformed entire cultures?